The new Neverwinter Connections (NWC) has now launched, as a freely available game scheduling and matching service for the Neverwinter Nights community. (And although NWC is now found at NeverwinterConnections.org, it has the old NeverwinterConnections.com banner at the top, for nostalgia's sake). Everyone is welcome to peruse the site's contents, register as users, familiarize themselves with its operations, and use it to schedule and manage their Neverwinter Nights games. Game creation and management is patterned after the old NWC, with any registered user able to set up an Open, Application or Invite-Only game on the calendar, which adjusts automatically for members' time zones. Scheduled games are displayed on the home page calendar and also on the main Events page. The site furthermore integrates the Neverwinter Connections Discord channel administered by Ranan and the Neverwinter Connections forums hosted by Venture at the NWN Campaigns site, which also offers free campaign forum hosting for player groups. 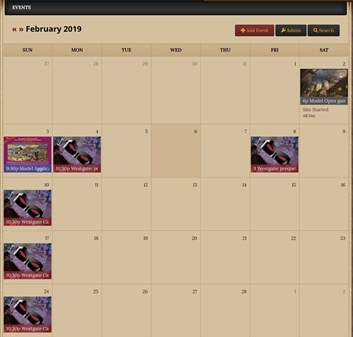 Thanks go to both of the site admin for their service to the community, and for welcoming the opportunity to gather together the full range of NWN multiplayer support services (calendar, forums, chat) as a package at the new Neverwinter Connections. We are still adding content to the site and forums, and welcome input on what would best serve the multiplayer community's interests and needs. NWC exists (again) thanks to a number of people in the NWN community who never gave up on the idea, and who expressed a desire to have a common place to go to for organizing games. It also would not exist without the success of Neverwinter Nights: Enhanced Edition (NWN:EE) by Beamdog, especially their continued support and development of the multiplayer experience.